Improving your smile is not just a goal, but also a commitment you make for yourself and your wellbeing. Improving your smile is not only about enhancing the aesthetics of, and treating the flaws of your teeth. It’s also about maintaining healthy teeth and gums for a healthier you. Brushing and Flossing – it may seem obvious, but every time you brush and floss your teeth, you are keeping your mouth clean and healthy. That’s why brushing and flossing are the most important tools when it comes to oral health care. Dental bonding – if you are not happy with the way your teeth look, dental bonding may be the answer. Bonding can help restore the natural look of your teeth. Your dentist will bond the materials directly on your teeth. The porcelain and resins will create a strong structure that looks beautiful and natural. Porcelain Veneers – veneer are thin shells made of tooth-coloured materials. They are used to cover the front side of teeth that have flaws. Unlike dental bonding, veneers require the removal of a small amount of your tooth enamel to accommodate them. Porcelain veneers look natural on teeth and are versatile cosmetic solutions. Dental crowns – crowns are ideal for covering teeth that are discoloured or badly shaped. They can make your tooth stronger while improving its appearance. Dental crowns are also used to attach to dental bridges, protect a weak tooth or restore a broken tooth. Dental implants – implant dentistry is one of the most popular methods to replace missing teeth. The implant serves as a sturdy anchor for replacement teeth. Dental implants are made of titanium and other sophisticated materials. They are designed to hold restorations such as crowns and bridges. Implants are long-term solution for restoring your smile. Teeth whitening – this popular treatment is sought by individuals who want to have a dazzling white smile. Professional teeth whitening is the safest and most effective way to whiten your teeth. You can choose between at-home whitening using a custom made tray and whitening gel solution, or in-office whitening using a special light to whiten your teeth in less than an hour. Your dentist will tell which of the two is the most suitable for you. Regular dental visits – visiting your dental team at least twice a year is one of the simplest things you can do to improve your smile and overall oral health. Your dentist will check your mouth for cavities and gum disease, as well as perform routine cleaning. In this way, you can prevent oral health diseases that may ruin your smile. During check-ups, your dentist can also offer options that will make your smile brighter, healthy and beautiful. At Simply Smiles Dental, one of our expertises is to provide you the smile of your dreams. We offer a wide range of procedures that aim to enhance the aesthetics of your teeth at the same time you improve your oral health. If you are not satisfied with how the way your smile looks, give our office a ring and our dental professionals will do everything to meet your smile goals. Our office is in Toorak Village, in the heart of Toorak, and serves patients from Toorak, South Yarra, Prahran, Windsor, Southbank, South Melbourne, Port Melbourne, Malvern, Albert Park, Melbourne CBD, and other metro areas. We are a Medibank and HCF Members Choice Dentist and an HCF Members Choice Dentist. 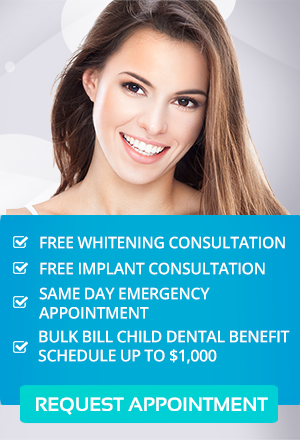 Contact us on (03) 9826 2220 to claim your FREE Teeth Whitening or Dental Implant Consultation. Good News For Families: Child Dental Benefits Schedule Extended In 2017!